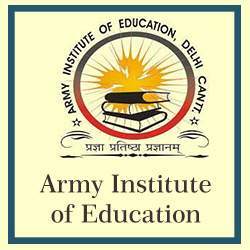 Home > Entranceexam > Army Institute Of Education (AIE) B. Ed. Admission 2018 - Application Started! Army Institute of Education (AIE) B. Ed. Admission 2018 - Application Started! About Army Institute of Education B. Ed. Army Institute of Education (AIE) BEd Admission 2018 prospectus has been released.The application process for the admission into the Army Institute of Education has also been started from 16 January 2018. The last date to apply is 17 March 2018 and the exam will be conducted on 22 April 2018. However, the candidates can apply until 30 March 2018 with late fee of Rs 100. The institute is affiliated to Guru Gobind Singh Indraprastha University (GGSIPU) and recognised by NCTE Jaipur. The admission in the BEd course is done on the basis of Written Admission Test (WAT). Candidates can get here the complete details like eligibility criteria, application process, result, admit card etc. regarding Army Institute of Education (AIE) BEd Admission 2018. Subscribe for Regular Updates of Army Institute of Education B. Ed. Age Limit: Candidates should be below 35 years of age as on 1 August 2018. The upper age limit may be relaxed up to a maximum of 5-years in exceptional cases by the competent authority in the university if he/she is satisfied with the merit of the case. Candidates with at least 45% mark either in Bachelor’s degree in Sciences, Social Sciences, and Humanities. Candidates having Bachelors degree in Engineering or Technology with specialization in Science and Mathematics having 45% marks or any other qualification equivalent thereto are eligible to apply for the BEd admission in the Army Institute of Education. Physical Fitness: The candidates should be certified as physically and mentally fit to pursue the B.Ed. course by an MH/ RMO/ Registered Medical Practitioner. NOTE: 5% weightage be given to war widows/dependent of war widows (Army). Candidates are advised to check information Bulletin (given on this page) for detailed eligibility criteria. The candidates seeking admission to Army Institute of Education (AIE) to pursue B.Ed course would be required to fill up the application form. There are two ways to get the application form, the candidates can either download the application form or can obtain the prospectus through Demand Draft in favour of ARMY INSTITUTE OF EDUCATION, GREATER NOIDA payable at Greater NOIDA or requesting it by post against the payment of a requisite fee. Following documents will be enclosed with the application form and the candidates are advised to ensure that they have annexed all the relevant ones with their application forms before sending it to Army Institute of Education, Greater Noida. Admit Card and Attendance Card. Proof of age as per 10th / 12th standard or Equivalent Examination Mark-sheet /TC. Statement of Marks of qualifying examination with aggregate marks. Certificate 1 to 7 (As Applicable). Army Institute of Education BEd WAT Admit Card will be issued to the candidates appearing in the exam from 31 March 2018. The admit cards will be issued only to the candidates who will fill and submit the application form before the due date. The exam for the same is scheduled to be conducted on 22 April 2018. The admit card will be sent by speed post or registered post on the address provided by the candidates on the envelope of the application form. The admit card will carry the WAT Roll Number and other important details. The candidates are suggested to check all the details on the admit card. The candidates can obtain the application form against the payment of application fee. The amount of getting the prospectus by post or through Demand Draft is different. The candidates have to make the payment of the following amount to get the application form. The result of WAT exam conducted by Army Institute of Education will be declared on 7 May 2018. As soon as the result gets declared, the same will be available on this page and the candidates would be able to check the result on this page. The result will also be sent to all Command HQs and HQ Delhi Area and will be displayed on the notice boards/websites of AIE. Candidates declared who have qualified WAT and recommended for admission to Army Institute of Education will be individually informed by the Institute. The admission into the Army Institute of Education to pursue BEd course will be done based on WAT score only. The candidate will be permitted to join the course only after full payment of the course fee. If a candidate fails to pay the requisite fee as declared in the prospectus or fails to join the course by the due date, his / her candidature will be cancelled. The seat offered to the candidate will be allotted to someone on the waiting list. Request for seeking extension in time for joining the course will not be entertained. There are total 15 test centres where the Written Admission Test (WAT) exam would be conducted. The candidates are suggested to go through the complete list of exam centres. The candidates would be entitled to choose any three exam centres as their preferences. More about Army Institute of Education B. Ed.